Happy Thursday, hope you are all having a wonderful week! Love this outfit!! Never would have thought to style the dots with plaid! <3 it!! & you looks fabulous as always! 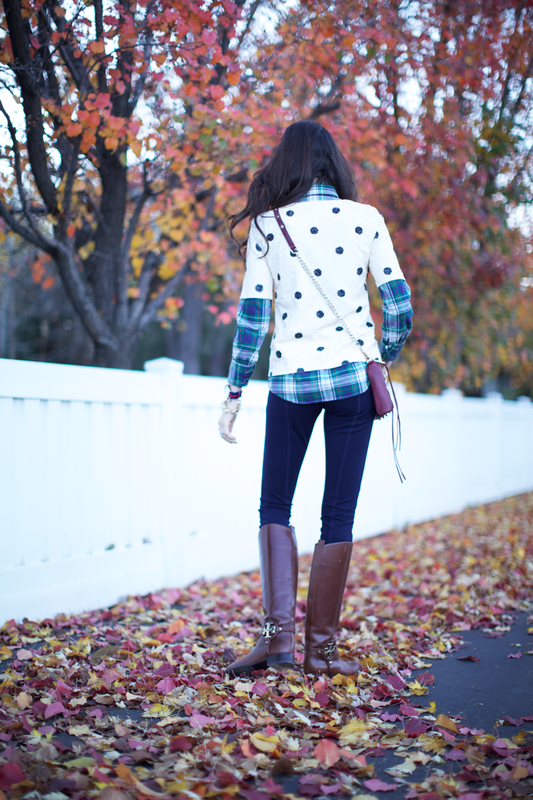 I LOVE that you layered a plaid button up under polka dots! I might need to try and recreate this! i love this! your sweater is absolutely gorgeous! I just can’t get enough of that sequined top!! Love how unexpected it is with the plaid – so pretty! Love that polka dot top. I’ve ordered mine and it should be arriving tomorrow. I can’t wait!!!! I’m so excited. It’s absolutely stunning. I can’t wait to wear it during the holidays. A quick hello to you too!! Love those boots. Gorgeous as always! I love the lipstick what color is it? I’m so in love with this sweater! Great look. I love this! It looks so effortless yet adorable at the same time. I love your style! very jealous of your watch, perfection. This look is very interesting. I would never think to put those tops together but you make it look cute. Great boots! Very very lovely outfit! I love the polka dots with the plaid underneath! And those boots are awesome. Your styling is impeccable! Gorgeous! 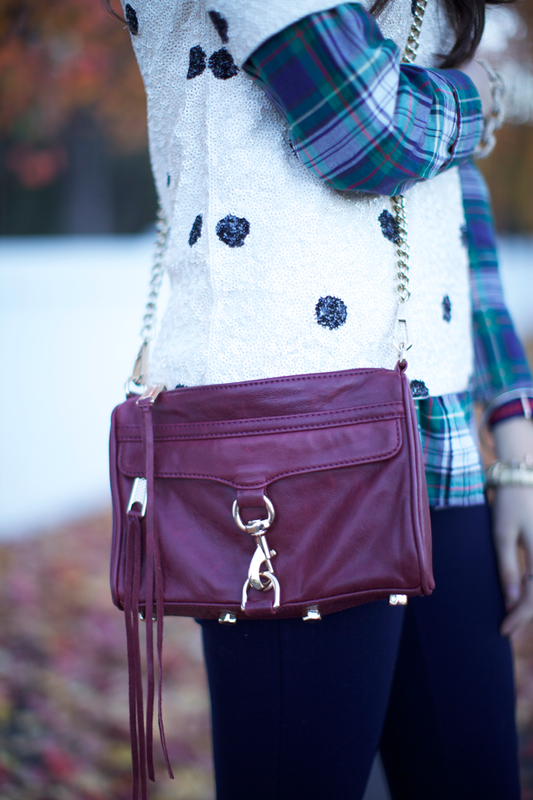 I am in love with this oxblood RM bag – saw on shopbop the other day and wanted instantly. You looks gorgeous as usual, lady! love this outfit! and those leaves are awesome! love the entire outfit, especially the bag, plaid shirt and the watch !!! That Jcrew top with polka dots just got on my craving list. Your outfits are always adorable! Love the pretty fall background too! The dot sequin top is just perfect! I love this plaid shirt and your bag! Sequined dots over plaid. Who would have thought it would look this amazing. Great inspiration, thank you! Oh I love, love, LOVE that top! And the plaid/polka dot combo is amazing! Included the black version in my Friday faves a few weeks ago – so perfect! Love the top and the pattern mixing. Love the mixing of prints, this is too cute!! Those boots are also amazing! You are the master of print mixing. Love this!! SO cute!! Obsessed with that bag & your boots! love that sequined polka dot shirt, I have been seeing it around lately and just love it!! Sequins + plaid = amazing! Love the bag, too :) Great outfit (per usual)! Too cute! Loving the polkadot/plaid combo! Perfect outfit! I have everything in my closet to recreate this! Just might have to do that! Thanks for the inspiration! lovely outfit. The bag is very nice. Can’t wait to see winter outfits! Love the polka dots and plaid!! I just adore those autumn leaves! & the outfit of course! Plaid and that bag. Oh man. I LOVE how you put these tops together!! I need to scour my closet to see if I can something similar! Thanks for the idea Rachel!! What lipstick are you wearing here?? http://alphabitty.com – personalized artwork & stationery for babies! you are such an itty bitty! I always love how you sprinkle in polka dots! Love your style! I should not be THIS excited about a sequined shirt, but I am. Love the pattern mix! i’m not sure what i love more…the bag or the boots?!?!? LOVE. Love that polka dot top!! Such a cool mix of glam and cozy layers. I love that watch! That sequined J. Crew top is amazing!!! J. Crew should just hire you as their spokesmodel. I love your style! I love the plaid under polka dots. And those boots…on my wish list:)! Gorgeous look! you look great in these photos! love the look. Caving and getting the pixie pants! Could not resist! Love the way you put this whole outfit together! It looks great on you! We love this lip color on you as well. I absolutely love the polka dots and tb boots! 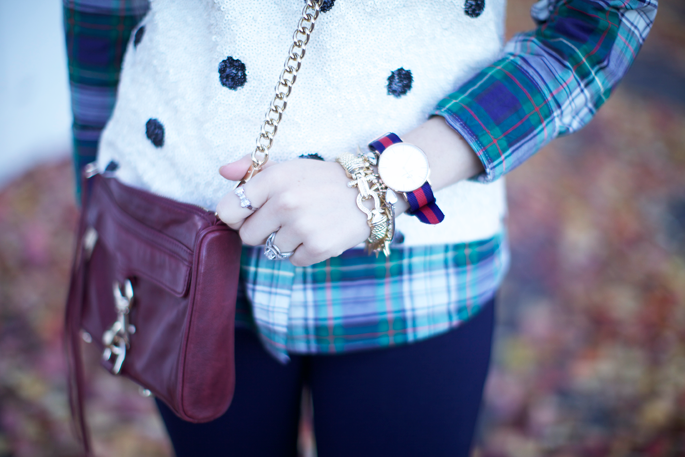 Love the plaid and the dots! Great look!